Northern Vietnam is the oldest and most geographically diverse region of the nation, with a history of occupation by China, France and Japan. The region’s cuisine is shaped by both long-standing traditions and heavy foreign influences. In the vast mountains bordering China and Laos, with� Sapa as the most popular destination, about 30 ethnic minorities live in partial seclusion and maintain their unique customs. The forests, upstream rivers and terraced fields provide special spices and ingredients. In the Red River Delta, farm animals and freshwater species are commonly used. The flavour and texture of food is lighter than elsewhere in Vietnam, with a preference for sour and salty rather than spicy and sweet. The capital� Hanoi is where many Northern Vietnamese dishes are made popular. 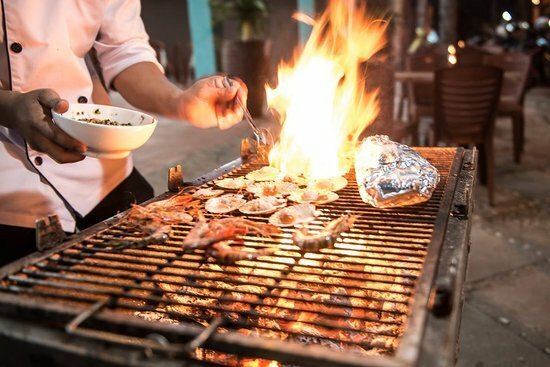 The coastal areas, including the world famous� Halong, add a supply of seafood and especially fish sauce to the Northern cuisine. 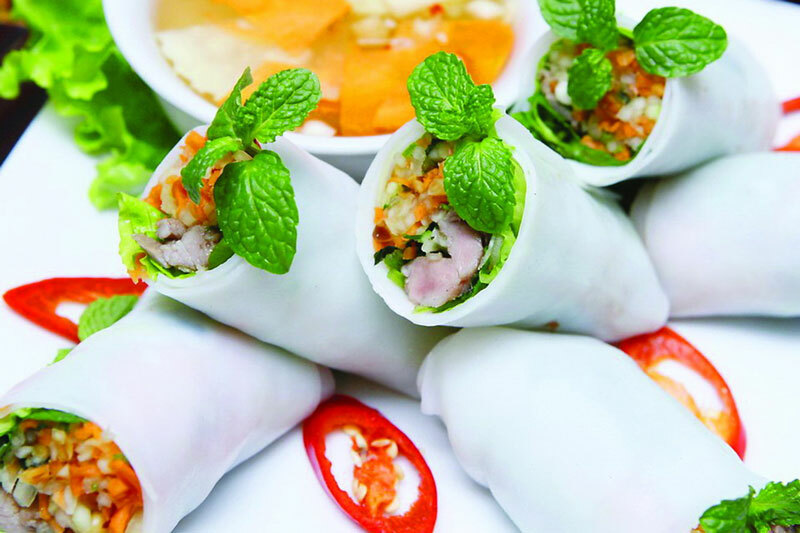 Vietnamese cuisine is famous for its rolls, and Northern Vietnamese cuisine is no exception. The standard dipping sauce is� nước chấm. 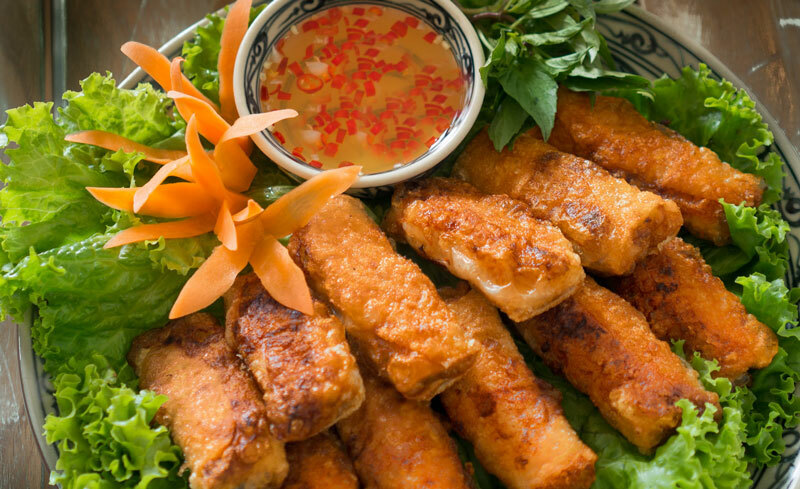 Nem is the Northern Vietnamese name for fried spring rolls, made from crispy rice paper wrapped around a mixture of minced pork and/or sea crab, vegetables, mushrooms, glass noodles and egg yolk. Bánh cuốn� is a thin sheet of rice flour steamed and rolled with minced pork and wood-ear mushrooms, topped with fried shallots. Phở cuốn is a simple roll of unsliced� bánh phở filled with stir-fried beef, lettuce and cilantro. Apart from the use of white rice (cơm)� as a staple, sticky rice (xôi)� is also popular. 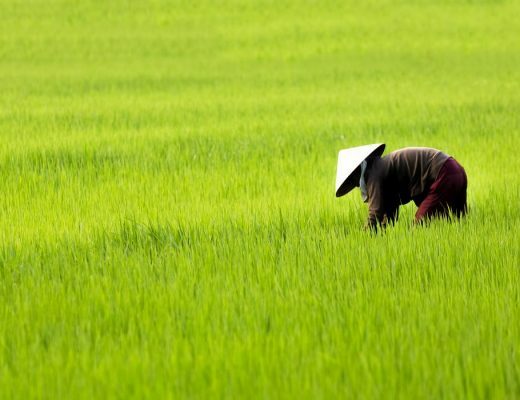 Broken rice is less common in the North than in the South. Cơm lam is salted rice cooked in bamboo tubes, a traditional way to prepare for long journeys in mountainous regions, such as in� Mai Chau. Bánh chưng is the traditional food for Tết in Northern Vietnam, made from sticky rice, mung bean paste and fatty pork wrapped in green leaves and steamed for a whole night. Bánh khúc has three layers: a ball of mung bean paste and fatty pork, a skin of rice flour mixed with fragrant� rau khúc (cudweeds), and sticky rice, all wrapped in banana leaves. 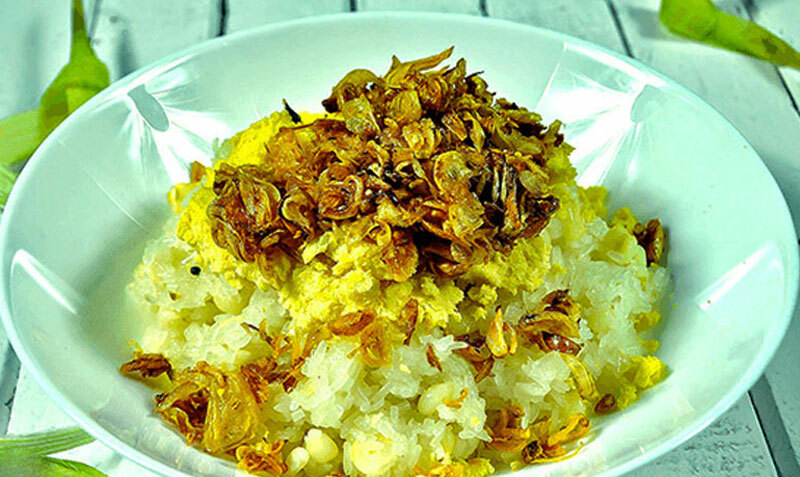 Xôi xéo is sticky rice coloured with turmeric powder before steaming, topped with savoury mung bean paste and crispy fried shallots. 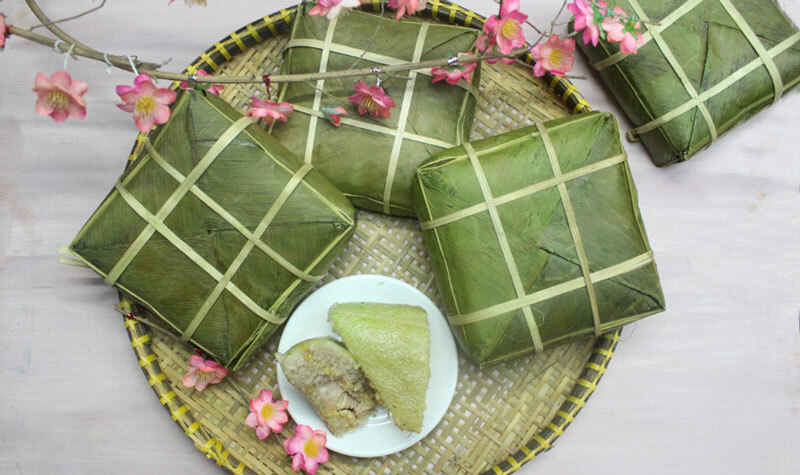 Cốm� is a Hanoian snack made from young sticky rice, lightly roasted and flattened, then wrapped in lotus leaves. 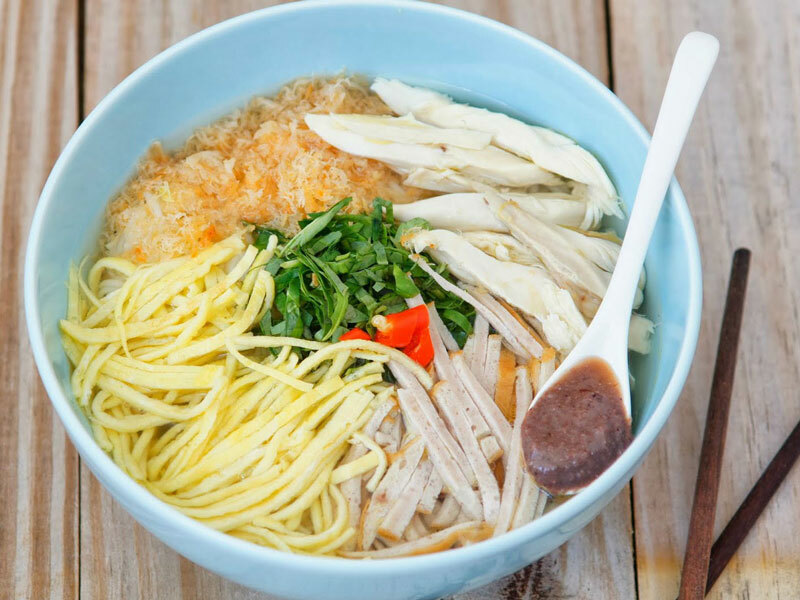 Soup noodles bring comfort in winter when the northeast monsoon blows, but on sunny days, non-soup noodles steal the show. 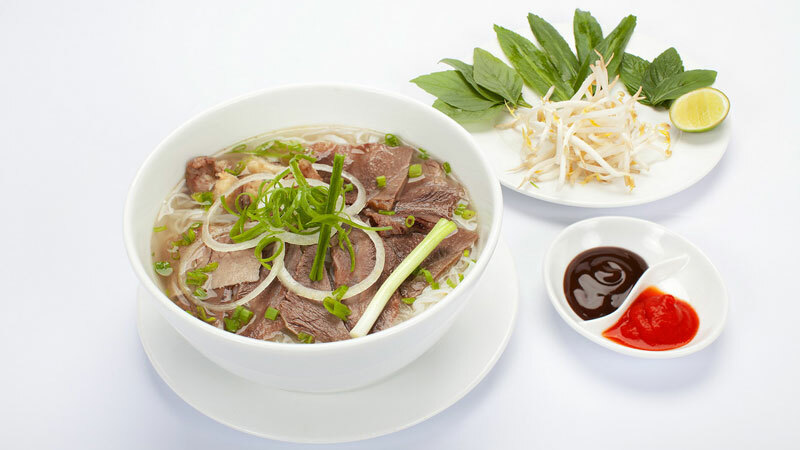 Phở, the national dish influenced by both the French taste for beef and the Chinese love of noodles, has been around since the 1920s. Hanoians like it traditional: clear beef bone broth, rice noodles, beef slices, onions, and lime and chili to taste. 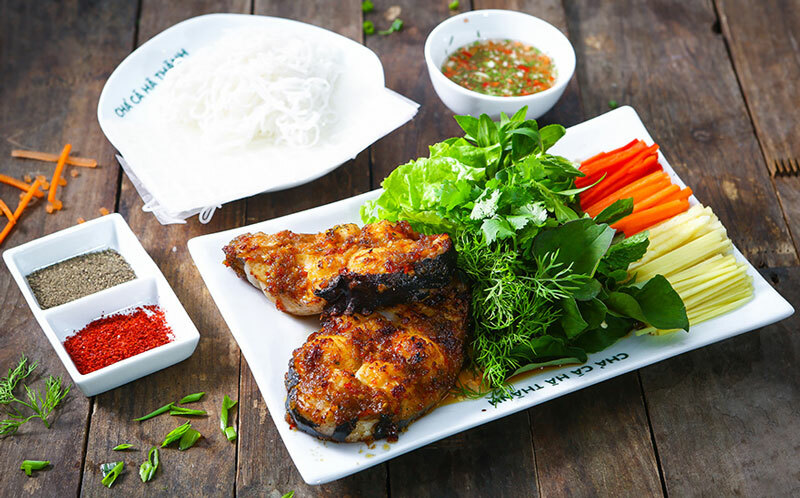 Bún chả, Hanoi’s favourite lunch, combines grilled pork and rice vermicelli dipped in� nước chấm with pickled carrot and green papaya, and fresh herbs. Bún thang is the epitome of Hanoi’s cuisine, a colourful combination of chicken slices, thin strips of fried eggs and Vietnamese sausage, shredded shrimps, shiitake mushrooms, pickled daikon radish and herbs with rice vermicelli in a clear broth. 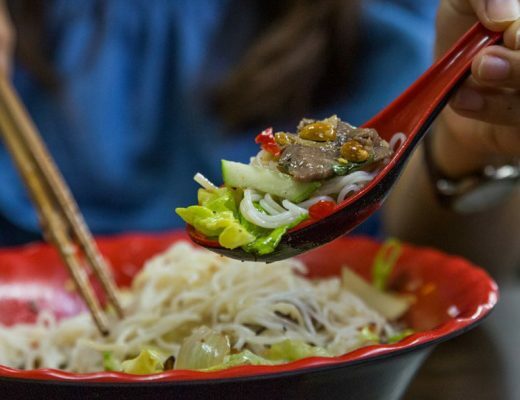 Bún bò Nam Bộ is a beef noodle salad, originally sold on Nam Bộ Street (now Lê Duẩn Street). Rice vermicelli combines perfectly with stir-fried beef, bean sprouts, fried shallots and peanuts, dressed in� nước chấm. 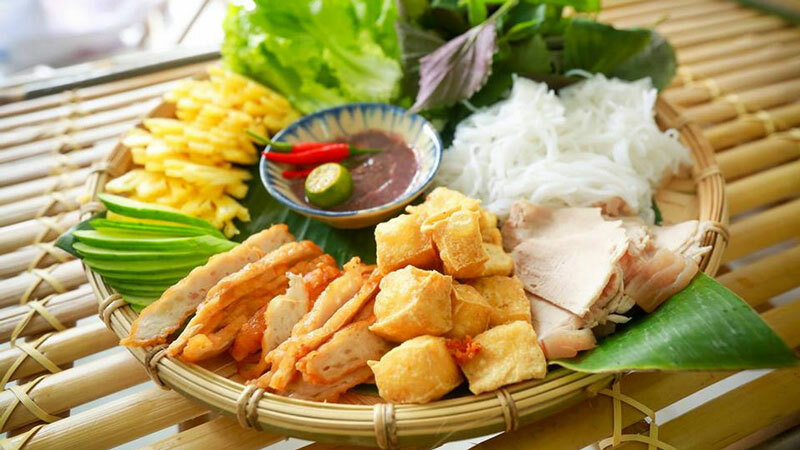 Bún đậu originated in rural Northern Vietnam, on the simple premise of rice vermicelli bundles and fried tofu dipped in shrimp paste or fish sauce. Like other regions in Vietnam, the North has a vast supply of aquatic creatures, and creative ways to turn them into food. Chả cá Lã Vọng� is a fancy dish of grilled� cá lăng (large catfish) marinated with galangal and turmeric powder, then pan-fried with dill and spring onions on the dining table, and served with rice vermicelli. Chả mực is a fried fishcake made from cuttlefish pounded in a mortar and pestle, a Halong specialty. Bánh đa cua is popular in Haiphong, using the local red rice noodles called� bánh đa đỏ and a broth made from tomato and minced paddy crab. 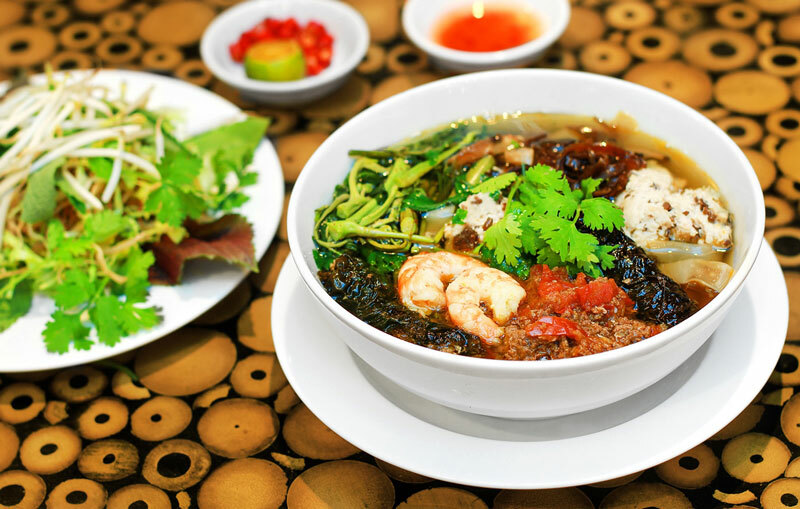 Miến lươn, both soup and dry versions, consist of glass noodles made from mung beans, stir-fried or deep-fried swamp eels, and herbs. It is best served spicy.